I didn't get a post up yesterday, so you get two ink reviews today. 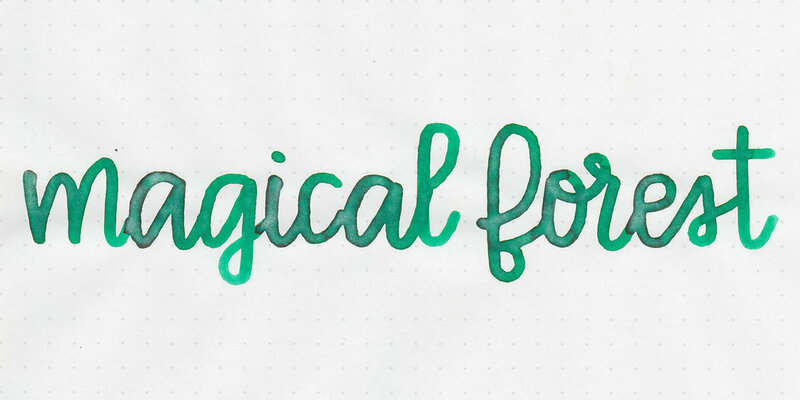 Today's second ink is Diamine Magical Forest, from Diamine's 2015 Shimmertastic collection. I purchased my sample of ink from Vanness Pens. Magical Forest is a medium green with silver shimmer. Don't laugh, but when I first saw the dry swabs of this ink, it immediately made me think of Slytherin house from Harry Potter-the green and silver match so well. The dark pink sheen only shows up in large swabs and ink drops on Tomoe River paper, it does not show up in writing. Other properties: medium shading, a tiny bit of dark pink sheen in large swabs, and silver shimmer. On 20 pound copy paper the ink behaved really well-no problems. Ink swabs for comparison, left to right (top to bottom for mobile RSS): Diamine Golden Ivy, Diamine Magical Forest, and Robert Oster Emerald. 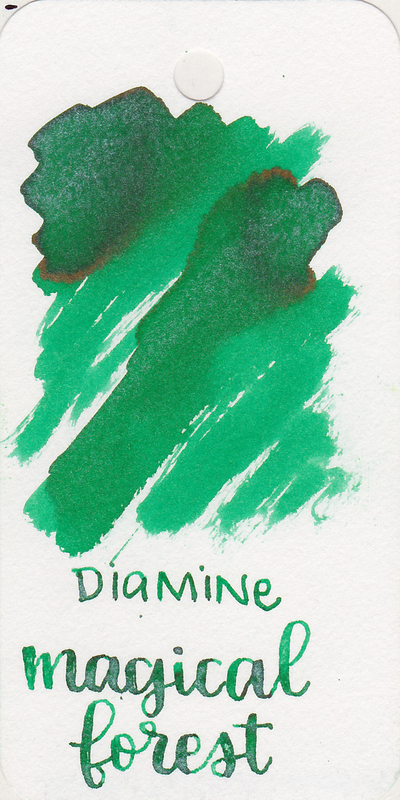 Click here to see the Diamine inks together (the shimmertastics are at the bottom of the page). Robert Oster Ryde Green, Robert Oster Green Diamond, and Robert Oster Peppermint. Click here to see the green inks together. Green Diamond seems the closest non-shimmer ink to Magical Forest. I used a medium Pelikan 605 White Transparent on Tomoe River paper. The ink felt just a touch dry. Overall, I really like the color. I prefer this ink in wetter, larger nibs. It performed really well in the slightly wet Pelikan medium nib. If you like green and silver, I would give it a shot.